An integrative team who cares deeply about your needs, process and results. We focus on client-centered care to make your experience the most tailored and best in the city. We aim to help you improve your health literacy and self care to maintain long-term results. We value compassion, respect, equality & a high standard of care. Monika Czuprynski, RMT, Director, (currently studying overseas) is a passionate Manual Osteopath and Massage Therapist. Her vision is to create a safe, integrative space that helps people restore their self worth and appreciation for their own body and health. She studied Massage Therapy at Lakeland College, graduating in 2007, and Manual Osteopathy at the National Academy of Osteopathy, graduating in 2013, and is currently continuing her studies in Australia. Please contact our clinic if you have been referred to see Monika for care, we will point you toward the best suited therapist. Brad Ballard, RMT, is a former Paramedic turned Massage Therapist who brings a passionate and caring nature to his treatments. He has completed his 3000 hour RMT training at Makami College, bringing him past the industry standard of 2200 hours. Brad's previous experience in injury management, emergency response and stress management have lead him to specialize in injury rehabilitation, chronic pain, and stress related neuromuscular disorders. The body-mind connection is an important philosophy in his treatments, as physical and emotional stresses are tied together. He believes in tailoring his client's treatments based on their needs and goals. Brad will work with you to explain the cause of your pain and provide you with the resources needed to get you pain free. When he isn't at Reset Wellness, Brad ca be found practicing martial arts and meditation, or venturing on long hikes. 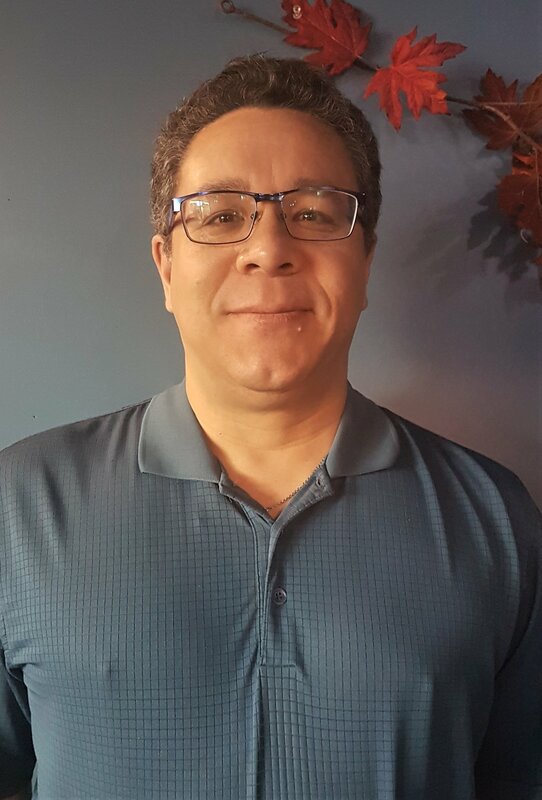 Lloyd Chung, RMT, graduated from the Grant MacEwan College Massage Therapy program in June 2002 and became a member of the MTAA in 2003. Recently, Lloyd took a course at the National Manual Osteopathic College and is finishing his practical hours to become a Manual Osteopath. Lloyd believes that massage should be seen as a tool that everybody should use to prevent pain and injury and maintain a healthier lifestyle, not just as a quick fix for pain and injuries. He also believes that a therapeutic or deep tissue massage can be relaxing and doesn’t necessarily need to be painful. Manual Osteopathy will allow Lloyd to continue on his path of gently guiding and correcting the body towards less pain and better health. When Lloyd isn’t working or spending time with his wife, son and daughter, he enjoys playing trombone with the Festival City Winds or relaxing with a good book. Tristen Threefingers, RMT, is a dedicated Massage Therapist who has completed her 2200 hours at Makami College, and is currently finishing a total of 3000 hours of Massage Therapy education. She will be graduating on April 18, 2018. Tristen specializes in focused Deep Tissue Massage, Sports Massage, and Hot Stone Massage. She enjoys tackling challenges and learning from them, and would like to further her skills in neuromuscular, and orthopedic treatments. She is committed to sharing her knowledge and talent with individuals to relieve pain, stress and anxiety, and restore balance and harmony. On her days off, she loves to paint and draw, watch anime, and go on peaceful walks and enjoy the world. Dr. Suh Ha Lee, OMD, PhD, R.Ac., is a registered acupuncturist and herb doctor in Alberta and has completed her PhD in Oriental Medicine(OM) in Korea. She took her training in Kyung Hee University, which is graded as #1 school in Oriental Medicine School in Korea. Oriental Medicine program in KH University is at least 6-year course with an intense education and training. Dr. Lee had worked in many OM hospitals, clinics and laboratories. The tools she usually uses are acupuncture, electro-acupuncture, lipolysis-acupuncture, moxibustion, cupping and herbs. She has extensive training experience in MPS (myofascial pain syndrome) and trigger point management for various pains, facial rejuvenation, detoxification, and weight loss. Her extensive knowledge and many years of experience in medical and aesthetic treatment will help you restore health and beauty. People are suffering from lifestyle diseases such as obesity and accelerated aging due to environmental pollution, processed food, and excessive consumption of calories. Esther is here to help you to restore your health through solving the fundamental problems through nature. Acupuncture and herb are the most natural way. If you are suffering from light symptoms such as flu to various internal/external pain or imbalance in your body, Esther is willing to share the exciting and intriguing experience of the nature’s secret, the creator has given us. OM has developed distinctive features. -Inhibitory effect of Angelicae Tenuissimae Radix on expressions of cyclooxygenase-2 and inducible nitric oxide synthase in mouse BV2 microglial cells. Neurological Research, 2010, Vol 32, Supp 1 (SCIE, ISSN: 0161-6412, IF: 1.634). Suh-Ha Lee, Hoyoung Choi, Hocheol Kim, Hye-Jung Lee, Yun-Hee Sung, Sung-Eun Kim, Hyun-Kyung Chang, Min-Chul Shin, Mal-Soon Shin, Chang-Ju Kim. Shari Arial, Trauma Informed Yoga Therapist, began her journey to become a yoga therapist several years ago when she suffered with her own stress and burn-out. Coming to the awareness that something needed to drastically change in her life, she stepped away from the corporate world and began her 200 hour Teacher Training on her way to being a yoga therapist. Having completed over 600 hours of 954 hours towards IAYT (International Association of Yoga Therapists) accreditation, Shari is a Phoenix Rising Yoga Therapist since 2015 and continues to specialize in care for anxiety, stress and PTSD. She practices as a trauma informed yoga therapist and has developed her specialized form of yoga therapy for mental wellness, SAF Yoga Therapy. Shari's focus and passion is to support those seeking relief from their mental and physical stress, helping people discover - for themselves - why and how they are contributing or acting in their current mental, emotional and physical state, providing remedy to overcome the limitations. Clients can expect Shari to support them by offering the space for them to acknowledge whatever is happening in their bodies, how that might translate into their daily lives, and make choices that support positive change. Touch & talk, yoga & therapy. April Kosinski, Corrective Yoga Teacher, holds a 500 hour certification as a Registered Yoga Instructor through the Yoga Within centre and specializes in body mechanics yoga and retraining movement patterns. April had suffered serious injuries from a snowboarding accident, as a result experiencing constant migraines and body pain. She moved her body in to better health by gradually and gently practicing yoga, stretching at home, meditating, and practicing pranayama (breath work). All of this kept her attitude in check while regaining physical strength - she's now back on the slopes and migraine free. April has been teaching since 2012 and believes yoga is for every body. Whatever your ailment, body type, age, fitness level or attitude, April works to ease discomfort, helping you practice yoga safely to relieve pain. Her yoga classes and private sessions provide the opportunity to practice mindfulness, body mechanics and sustainable movement. Working together one on one, she designs yoga programs to meet the needs and experience of her clients. Clients can expect to learn and experience the connection between the mind and body, forming a relationship to themselves both mentally and physically, while improving their strength and flexibility. April is inspired by people and their potential, and helps those seeking to explore their own and ways to live a healthy and pain free life. Asha Thomas, Prenatal and Postpartum yoga teacher, took her first yoga class as a student almost a decade ago and instantly became passionate about the many benefits it changed in her life. In 2017, when she was expecting her first child she was challenged to learn how it could be adapted to her pregnancy as well as strengthen her quality of life postpartum. A certified 200 hour E-YT, Prenatal and Postpartum yoga teacher, Mindfulness coach, Kids yoga teacher and Early Learning Professional, Asha is passionate about bringing mindfulness and the benefits of movement to all parents and soon-to-be parents. Asha uses her knowledge and expertise of working with families in the child development industry to enrich her passion of advocating for the rights of the child and parent to prepare soon-to-be parents during their birth journey. Asha is committed to supporting moms through a conscious yoga class, fostering mindfulness, strength and flexibility while offering birth and postpartum education and support.